The Mississippi River Gulf Outlet (MRGO; commonly pronounced “Mister Go”) is a 76-mile long channel that was built to provide a navigation shortcut from the Gulf of Mexico to the heart of New Orleans. Authorized by Congress in 1956 and completed by the U.S. Army Corps of Engineers (the Corps) in 1968, the MRGO originally was 650 feet wide at the top and at least 36 feet deep. More earth was dredged to construct the MRGO than was moved to construct the Panama Canal. Proposed as an economic development project, the MRGO was lightly used and expensive to maintain. In 2006, the MRGO cost taxpayers nearly $20,000 for each vessel traveling in the channel. The MRGO also came at a steep environmental price, which scientists and communities along the MRGO had anticipated before the Corps started construction. 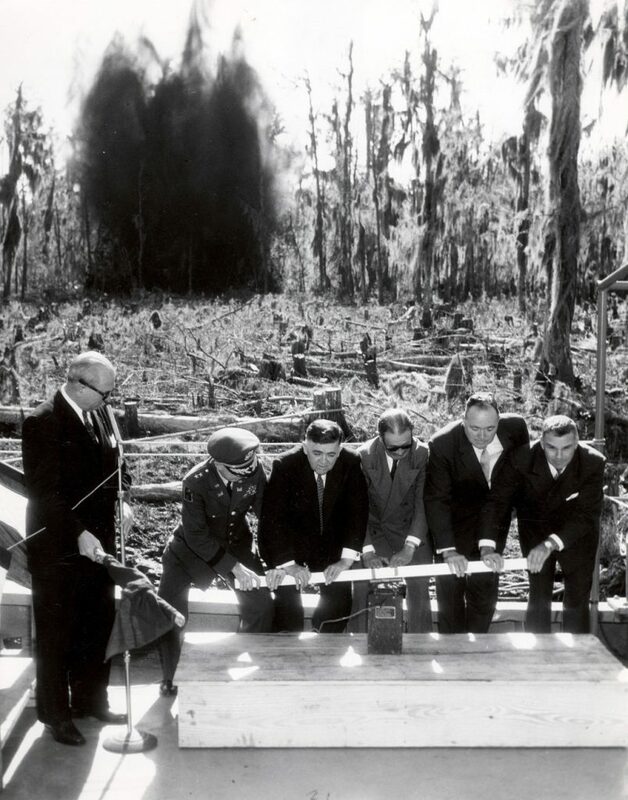 When the Corps dredged the channel, they converted 20,000 acres (31.2 square miles) of wetlands to open water, and allowed saltwater to flow inland from the Gulf, eventually damaging an additional 7,600 acres (11.8 square miles) of wetland and lagoon habitat. By 2005, erosion along the channel’s banks expanded the MRGO to a width of 3,000 feet in some areas, bringing it in close proximity to the hurricane protection levee. Saltwater moving up the channel also damaged or destroyed freshwater cypress forests of Orleans and St. Bernard Parishes, and created a dead zone in Lake Pontchartrain. All told, the construction and operation of the channel has impacted more than 618,000 acres (965.6 square miles) of habitat—an area almost three times the size of New York City’s five boroughs. 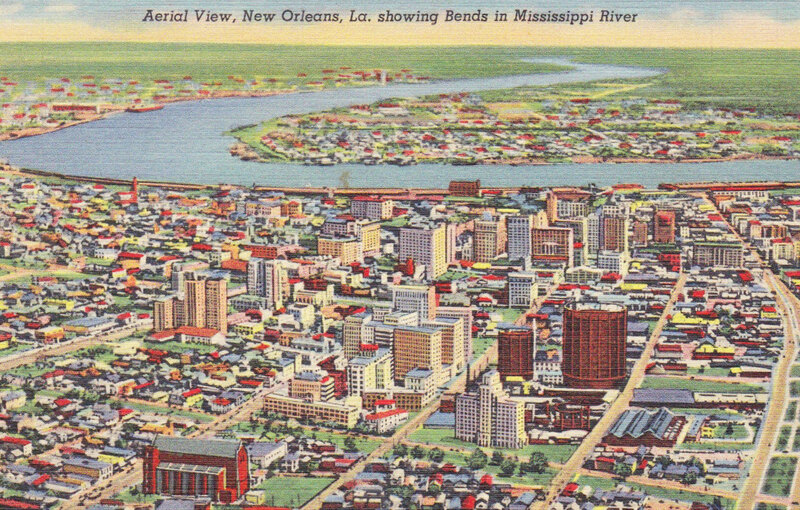 1940’s Aerial Postcard of New Orleans and the Mississippi River’s Unadulterated Wetlands. Prior to construction of the MRGO, the coastal wetlands provided economic opportunities, helped clean water, and provided natural storm surge protection to urban communities like the Lower Ninth Ward, New Orleans East, Chalmette, and Arabi. St. Bernard Parish locals had long called for the closure of the meagerly utilized MRGO, but the exaggerated value of the outlet to the navigation industry perpetuated the channel. In 2005, Hurricane Katrina underscored the impact of the MRGO on wetlands and public safety. During Hurricane Katrina, MRGO intensified the impact of the storm by creating a funnel that channeled its surge into the heart of communities in Orleans and St. Bernard parishes. After toppling the floodwalls along the Inner Harbor Navigation Canal (IHNC), flood waters destroyed homes, leveled entire blocks and took the lives of an estimated 100 residents of the Lower Ninth Ward neighborhood in New Orleans. Make sure decision-makers prioritize MRGO-area projects that will protect the Greater New Orleans Region and restore this critical ecosystem. Send a note to the Federal RESTORE Council and the State of Louisiana today! Thank you!